Originally Posted by SUSGHOSH I am right now is in a very shocking position. I was just downloading the air tickets for our Andaman trip (scheduled on 13.10.2018) and in the website of Spicejet I discovered an alert! The flight has been cancelled. So SG cancelled (no withdrew), a route pair. i.e CCU-IXZ ! Go to the Ministry of Civil Aviation website, find out the regulator's website If memory serves me correct, it is Office of Director General of Civil Aviation. Read up on the regulation pertaining to carrier obligations. On Spicejet's site read up on Contract of Carriage. Compose a letter to CEO of Spicejet with grievance plus remedy offer, cc: Additional Sec incharge at the Ministry of Civil Aviation. Tweet to Minister of Civil Aviation on how horrible the Spicejet treated you. Remedy: Ask for tickets to BKK as fair compensation for emotional distress. There.... your Papdi Chaat is ready !!! Originally Posted by SUSGHOSH Definitely,but who will give me tickets Dada? That too during Durga Puja? Waiting for Tatkal ticket is also a big risk. Only can think of Darjeeling by bus. BTW, have you gone through nycank's suggestions ? Originally Posted by SUSGHOSH Definitely,but who will give me tickets Dada? @nycank, you made me laugh dear, but I am concentrating on planning to go somewhere at least as a compensation. Your BKK proposal is a cool one!Do you think writing a letter to ministry level will have any impact? The person (who picked up the call of mine- an employee of Spicejet) apologised so calmly, as if nothing happened. I was dreaming of visiting the cool beaches. I can see those places closing my eyes. I have read almost all the articles regarding Andaman posted here. My kids have told almost everybody they know, that they will be going to Andaman and it was supposed to be their first air travel! Darjeeling by bus, is it possible? Originally Posted by SUSGHOSH @nycank, you made me laugh dear, but I am concentrating on planning to go somewhere at least as a compensation. Your BKK proposal is a cool one! Spicejet resumes their Kolkata - Port Blair flight from 28 October 2018. You should be able to change travel date from 13.10.2018 to November/December/January free of cost from SG. Originally Posted by rshalder Spicejet resumes their Kolkata - Port Blair flight from 28 October 2018. You should be able to change travel date from 13.10.2018 to November/December/January free of cost from SG. Dada, as you know already ! It's all about Pujo ! Originally Posted by nycank Dada, as you know already ! It's all about Pujo ! Change of destination is allowed in case of cancellation from SG's side? Can't he change destination from Port Blair to any other place? SG flies from Kolkata to Agartala, Bagdogra, Bangalore, BangkokSuvarnabhumi, Chennai, Dhaka, Delhi, Goa, Guwahati, Mumbai, Patna, Port Blair(resumes 28 October 2018), Pune, Ranchi, Silchar, Srinagar, Surat, Visakhapatnam. SpiceJet shall endeavour to inform the passenger(s) about flight cancellation atleast three (03) hours in advance through telephone call or SMS or email, provided the passenger(s) have given correct and working mobile number at the time of effecting the reservation. 5,000 INR or booked one-way basic fare plus airline fuel charge, whichever is less for flights having a block time of 01 hour or less. 7,500 INR or booked one-way basic fare plus airline fuel charge, whichever is less for flights having block time of more than 01 hour and up to and including 02 hours. 10,000 INR or booked one-way basic fare plus airline fuel charge, whichever is less for flights having a block time of more than 02 hours. Delay of 2 hours or more from scheduled/revised departure time for flight having block time of up to two and a half hours. Delay of 3 hours or more from scheduled/revised departure time for flight having block time of more than two and a half hours and up to five (05) hours. Delay of 4 hours or more from scheduled / revised departure time for flights not falling under sub-clause (a) and (b) above. In case, the expected time of departure due to delay is more than 24 hours hotel accommodation shall be provided wherever necessary. SpiceJet shall have absolute discretion in selection of hotels under the given circumstances and no reimbursement shall be made in this regard. the cancellations/delays occur due to force majeure event, the impact of which lead to cancellation of the flight and which could not have been avoided even if all reasonable measures had been taken by SpiceJet. For this purpose force majeure event shall mean, including, but without limitation, political instability, natural disaster, civil war, insurrection or riot, flood, explosion, government regulations or order affecting the aircraft, strikes and labour disputes causing cessation slowdown or interruption or work, meteorological conditions, mechanical failures, commotion, embargoes, cancellation/delays clearly attributable to Air Traffic Control, security /safety risks or any other factor that is beyond the control of SpiceJet. The compensation mentioned above under respective categories is not cumulative and cannot be clubbed together. The above policies are governed by the Civil Aviation Requirements of Ministry of Civil Aviation, Government of India. Reservations No. :- +91 987 180 3333, +91 965 400 3333. Originally Posted by SUSGHOSH We have got no intimation...not from our travel agent who booked the flight!! I hope your travel agent had provided correct contact number and email in booking details. Ask them what to do. Cancellation and refund will be handled by the travel agent I guess. Originally Posted by SUSGHOSH Darjeeling by bus, is it possible? thank you all for our concern and a very good morning! I am supposed to travel with my parents too, so going to BKK option will not click. Though, it sounds good, nycank! @ rshalder, Changing date is also not possible, in that case our puja holidays will be ruined and we all wanted to move away from Kolkata during Puja. Plus, this year Puja holiday is in a perfect position, Sasthi on Monday, that means I was taking just one day leave and I am able to go on vacation for 9 days! These many leaves I will not get any time of the year. My travel agent informed me, if we are informed about flight cancelation before 60 days, only two options are left: 1. take any connecting flight which they are offering or 2. Refund. My agent is trying to manage a connecting ticket flight on 13th and 20th itself! Lets wait for few hours, otherwise I have to rearrange everything and may be we will be heading to Darjeeling by bus! Originally Posted by SUSGHOSH Lets wait for few hours, otherwise I have to rearrange everything and may be we will be heading to Darjeeling by bus! In that case book tickets on the very first day. 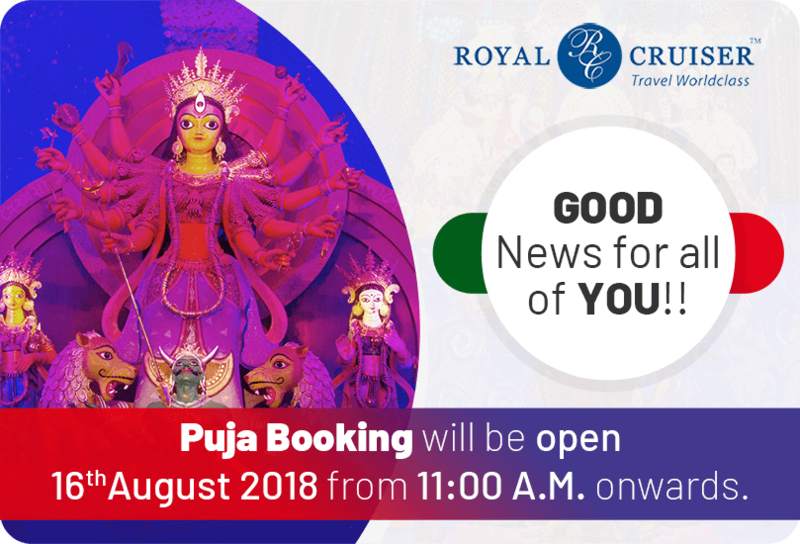 All Tickets of Volvo ( Royal Cruiser ) for Puja dates will be sold within minutes , even faster than train tickets . Telling it from my own experience. Probably there will be 2 / 3 buses (Royal Cruiser) a day from Kol to Siliguri on those days.